The increase of university tuition to 240,000 dong a month and swine flu have been cited by Dan Tri newspaper as two of the most outstanding education issues of 2009. 1. University tuition ceiling raised to 240,000 dong: On August 21 the Prime Minister raised university tuitions from 180,000 dong to 240,000 dong per month. The tuition adjustment is part of the National Assembly’s Resolution on renovating education and training finances. Tuition hikes have brought new worries to students burdened with higher daily expenses, room rents and other study costs. Many question if higher tuitions mean higher quality in education. 2. MOET drafts strategy for education development in 2009-2020: The Ministry of Education and Training (MOET) announced plans for education development in 2009-2020, but it was not welcomed. Many believe that the ministry needs to devise a more scientific and feasible strategy. Experts have pointed out that the time frame is not realistic and planners did not consult prestigious scientists and teachers from universities or education institutes. The plan’s goals are termed both unnecessary and unfeasible. 3. The future of multiple university entrance exams undecided: MOET tried multiple times to end university entrance exams and organize a single test for both high schools and universities, but the public has not supported the measure. 4. Many schools became hospitals to fight A/H1N1 flu: On July 19, 2009, Ngo Thoi Nhiem High School in HCM City became the first school in Vietnam to serve as a hospital to fight swine flu. Other schools followed, becoming makeshift hospitals with physicians, ambulances and medical equipment. 5. Schools try to renovate teaching and learning methods: Many schools have sought to improve teaching and learning methods to replace older approaches that have been criticized as “out of date and ineffective.” Luong Dinh Cua Primary School in HCM City, for example, organised group-based classes to shift to student-centered teaching methods. The HCM City Education and Training Department supported these changes. 6. Too many school fees frighten students’ parents: Education inspection tours discovered that schools collected too many fees and burdening parents and students. One primary school in Hanoi, for example, had a long list of 23 fees, which included unreasonable items such as the “tree care fund.” MOET instructed local education departments to examine university fee collection and impose heavy punishments on schools that collect fees in excess of the levels stipulated by MOET. 7. Many universities unable to meet basic requirements: In 2009, MOET discovered a lot of non-state universities that cannot meet requirements on land, permanent and visiting lecturers and curricula to organize classes. MOET also admitted its shortcomings in higher education management. 8. School morality emerged as a burning problem: People have demanded the reorganization of morality instruction for students, after many cases of students assaulting teachers after receiving low grades. 9. Short skirts banned: On October 5, 2009, MOET revised school uniform regulations to explicitly stipulate that students must wear skirts that reach knee-level. The requirement has not pleased many students, who believe that this regulation is too rigid. 10. Vietnam boasts outstanding young doctors: 2009 is the year of success for many young Vietnamese doctors. 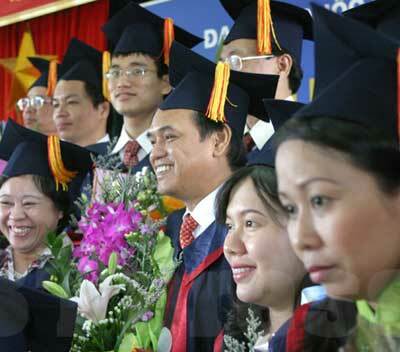 Dr Bui The Duy, Dean of the Information Technology of the Hanoi University of Technology at Hanoi National University, was granted the title of associate professor on November 20, 2009, becoming the youngest associate professor at age 31. Dr Nguyen Hoang Long, 26, has become the first Vietnamese lecturer at Oxford University.